Coffee Pot Stamping Cafe: Yes, It's a Birthday Card! It feels so good go be able to, once again, play along with some of my favorite challenges. Today's challenge is from the Retro Rubber Challenge. We could only use black and white, so it was fun trying to figure out a design and make it look good. I kept it clean and simple and made a birthday card. I know just who is going to get this and I'm sure she will find the humor of it. It is all stamped on one layer of white cardstock. 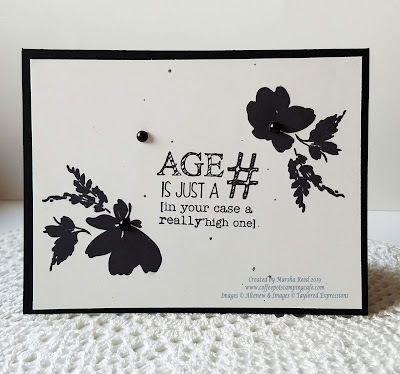 I stamped the flowers from the Billowing Blossoms stamp set from Altenew and the sentiment from the Another Year Older (2015) stamp set from Taylored Expressions in Jet Black. I colored the three pearls with a black Sharpie and the card was all done. The speckles on the white layer were left after I splattered another project and this was in the way. It works here so never throw those accidents away. You never know when they will come in handy. The colors I used are from the Retro Rubber Challenge. For all the challenge details and to share your project, click the image below. The layout of this card is lovely. The bold floral sprays draw your eye to that wry sentiment. I agree with you about not throwing things away - you indeed, never know what they'll come in useful for. The hoarder in me is encouraged by crafting! Thank you for joining in with us at Retro Rubber Challenge this week. Thanks, Jan! This may be a small stamp set but it sure packs a punch. The images are quite nice. Thanks, Claire! It's for my cousin and I know she'll get a kick out of it. LOL, I love the snarky sentiment..luckily it is framed with those gorgeous floral silhouettes! Someone will really love this one! Thanks for playing with our Retro Rubber challenge this week! 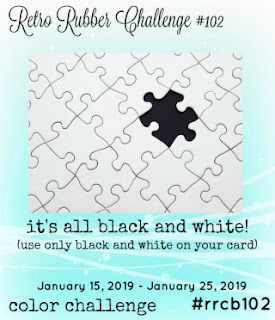 Amazing clean and simple design to use for our Black and White challenge. Love it when the scrap from another project is great for another new creation. Thanks so much for joining us at Retro Rubber for our challenge!